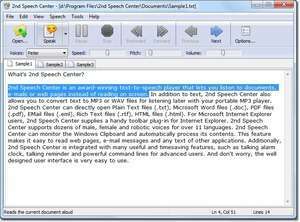 I hadn't heard of software for converting your text documents directly to mp3 files before I came across 2nd Speech Center. This award-winning software uses a computerized voice to read any text files that you want. With a convenient layout, 2nd Speech Center is very easy to comprehend even for the non-tech users. (I think I just made a word up! 2nd Speech Center 4.15.10.1202 is a shareware program and can be used as a demo to try the software until the free trial period has ended. A full version of the program is available after the trial period ends. For security reasons, you should also check out the 2nd Speech Center download at LO4D.com which includes virus and malware tests. Additional screenshots of this application download may be available, too.